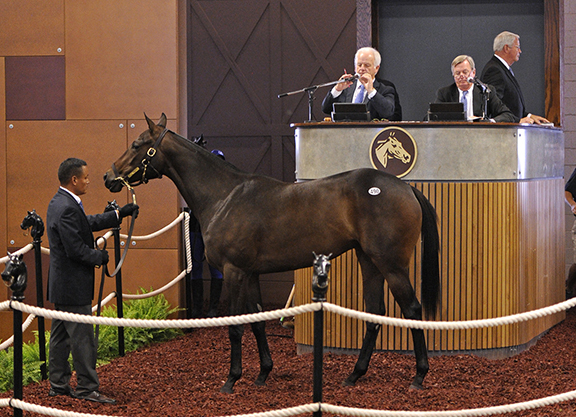 TIMONIUM, Md – The Fasig-Tipton Midlantic 2-Year-Olds in Training Sale produced the second seven-figure transaction in its history, as well as a record gross, but the two-day auction concluded Tuesday in Timonium with declines in average and median. During the two-day sale, 337 juveniles grossed $23,136,400, compared to 255 head grossing $22,659,000 in 2015. The average fell 22.7% from last year’s record-setting figure of $88,859, while the median dropped 28.9% to $32,000. With 598 horses catalogued, 455 head went through the sales ring and 118 were reported not sold for a buy-back rate of 25.9%. It was 21.5% last year. A year ago, the $1.25-million topper was one of 18 to bring $300,000 or more. That figure was 12 in 2016. Trainer Linda Rice, bidding on behalf of Chester Broman, saw off a determined Sam Herzberg of Sterling Racing, to securehip 490 for a sale-topping $1 million. By last year’s leading freshman sire Uncle Mo, the juvenile is out of Dream Street (Tale of the Cat) and was consigned by Al and Sally Pike’s Pike Racing. “It was so rewarding to see another million-dollar horse because it means people can bring that type of horse to this marketplace and feel confident that there will be people bidding on them,” Bennett continued. A colt by Maryland stallion Friesan Fire attracted the sale’s second highest price when selling for $825,000 to Crupi’s New Castle Farm. Trainer Linda Rice, bidding on behalf of New York breeder Chester Broman, went to $1-million to secure a filly by Uncle Mo during Tuesday’s second session of the Midlantic sale, giving the auction the second seven-figure transaction in its history. Hip 490, consigned by Pike Racing, is out of the unraced Dream Street (Tale of the Cat) and is a half to graded stakes placed Lassofthemohicans (Indian Charlie). The filly worked a quarter in a bullet :21 2/5 during last week’s under-tack preview. There was one thing Rice didn’t like about the filly. Broman’s recent graded stakes winners include 2014 GI Ballerina S. winner Artemis Agrotera (Roman Ruler). The Midlantic sales ring produced its first seven-figure juvenile last year when a filly by Smart Strike topped the sale at $1.25 million. The sale marked the first million-dollar sale for Al and Sally Pike’s Pike Racing. Pike purchased the filly privately after she RNA’d for $80,000 at last year’s Keeneland September sale and the partnership on the youngster included his client Danny Saloom, as well as the filly’s breeder Tom VanMeter. Bred by VanMeter, Gaines-Gentry Thoroughbreds and Fox Strauss, the million-dollar baby has a yearling half-sister by Super Saver who sold to Hunter Valley Farm for $90,000 at last year’s Keeneland November sale. Dream Street, in foal to Tiznow, sold for $110,000 to Olin Gentry at that same sale. Susan Moulton went into this year’s Fasig-Tipton Florida 2-Year-Olds in Training Sale as a seller, but she left as a buyer when she bid $110,000 to secure a filly by Into Mischief. The impulse buy from early March turned into mid-May profit when she resold the gray to trainer Linda Rice for $450,000 in Timonium Tuesday. The juvenile, who worked a furlong in :10 2/5 at Gulfstream, turned in a bullet quarter-mile work of :21 2/5 in Timonium last week. Hip 527 is out of Firey Glow (Smoke Glacken), a half-sister to graded stakes placed Crossing Point (Allen’s Prospect) and stakes winners Love Happy (Not For Love) and My Boy Kyle (Pembroke). A lifelong horsewoman, Moulton also does business under the name of the Texas-based Safari Bloodstock. ← Is ‘monumental force’ Linda Rice about to scale even greater heights?